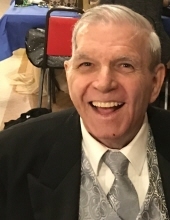 Celebrating the life of Richard Leonard Monson Sr.
Obituary for Richard Leonard Monson Sr.
Richard Leonard Monson Sr., 81, of Escatawpa, MS, passed away Friday, July 13, 2018 at his home surrounded by his family. Leonard was born on December 30, 1936 in New Orleans, LA to the late George and Marie Monson. He was a retired foundry worker foreman. He was a member of the Pascagoula Elks Lodge, American Legion, Krewe of Niords and Krewe of Tri Cities where he proudly served as King. He loved all sports and especially his New Orleans Saints. He was known for his crawfish and shrimp boils and loved boating and fishing on the Pascagoula River. He loved traveling and spending time with his family. In addition to his parents, Leonard was preceded in death by six brothers and four sisters. He is survived by his loving wife, Estelle Nelson Monson; children, Leslie Monson, Allison (Rodney) Lynch, Steven Creel, Ricky Creel, Tony Creel, Karen (Lewis) Johnson, Becky Cubbage and Richard Leonard Monson, Jr.; along with 15 grandchildren , 11 great grandchildren, and other relatives and friends. The visitation will be held Monday, July 16, 2018 from 10 a.m. until 11 a.m. at Heritage Funeral Home in Escatawpa, MS. The funeral service will follow in the funeral home chapel at 11a.m. Interment will follow at Evergreen Cemetery in Helena. To send flowers or a remembrance gift to the family of Richard Leonard Monson Sr., please visit our Tribute Store. "Email Address" would like to share the life celebration of Richard Leonard Monson Sr.. Click on the "link" to go to share a favorite memory or leave a condolence message for the family.